Monumental brasses were an alternative to a sculpted effigy, and were a relatively inexpensive way of commemorating the dead. This one depicts an unknown man praying. Paired with a woman adopting the same pose, it is likely that the brass commemorates the death of a husband and wife. Brasses like this are incidentally excellent records of changes in dress. Here, the long robe and garter belt with suspended pouch and rosary, can be recognised as distinctive features of male dress during the latter part of the fifteenth century in England. 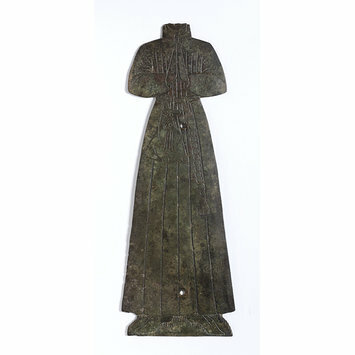 Both brasses, with their elongated forms also hint at contemporary notions of ideal body shape. Monumental brass of a male figure, the head missing, engaged in the act of prayer. The figure is depicted wearing a long pleated robe which goes down to his bare feet. Hanging from the man's girdle is a substantial purse or gypcière and a string of rosary beads. These details, as well as others such as the creases and pleats in the robe, have been engraved into the brass. Two holes visible in the centre of the brass would have been used to fix the object in its place. Monumental brasses developed in the thirteenth century and remained popular until towards the end of the seventeenth century. They were an effective means of commemorating the dead, and encouraging prayers for them. Unlike sculpted life-sized effigies in full relief, monumental brasses had the advantage of flatness and smaller scale, ensuring that they could be more easily accommodated in parish churches. The scale of monumental brasses ranged from more than life size to just a few inches. Historical significance: This period marked an increase in the production of monumental brasses, as well as their adoption by a wider section of society rather than being limited to ecclesiastics, knights and nobles. One of the most useful functions of the monumental brass today is as a record of contemporary dress. This example demonstrates the change in male fashion which occurred c.1470. At this time it became popular for men to wear a long tunic or gown that reached down to the wearer's ankles. From the girdle around the waist would be suspended a rosary and a large pouch known as a gypcière. Along with the style of dress, inscriptions could be used to identify the date of the brasses as well as often providing information about the subject depicted and original location. Unfortunately in this case no such inscription has survived. As an extremely durable material, brass (an alloy of copper, tin and zinc) was suited for the purpose of inlaid grave memorials which were generally set into church floors. To make a monumental brass, the required design would be sketched onto the metal and then engraved using a chisel or burin struck by a mallet. Monumental brasses were laid into shallow depressions within prepared stone slabs, often made of Purbeck marble from Dorset. Until the end of the sixteenth century, cast sheets of brass were mostly imported to Britain from the continent, and then designed and engraved by British craftsmen.